Every weekday, Michelle Deal, 26, takes an early morning bus ride from Cudahy to Milwaukee’s South Side. The ride is long, but Deal hopes that the hassle will pay off. At the end of her commute, Deal dons a bright “safety green” uniform and joins the ranks of the “neighborhood ambassadors” at Journey House, spending her days cleaning up the community and learning career skills that she hopes will help her in the future. Deal is one of 20 new neighborhood ambassadors at Journey House, located in Clarke Square. Now in its seventh year, the ambassador program helps connect Wisconsin Works (W-2) recipients with job training while beautifying the Clarke Square and Layton Boulevard West neighborhoods. Wisconsin Works provides employment preparation services, case management and cash assistance to low-income parents with minor children who meet eligibility requirements and who are willing to work. Alderman Bob Donovan spearheaded the initiative and helped secure funding using Community Development Block Grant money, according to Kevin Turner, who oversees the ambassadors at Journey House. The program is a collaboration between United Migrant Opportunity Services and Journey House, which also partners with the Clarke Square Neighborhood Initiative. Ambassadors also receive training from the Milwaukee Police Department. Neighborhood ambassadors spend half their time in neighborhood cleanup activities. Ambassadors pick up trash, remove graffiti, document and clean the exteriors of boarded-up houses, pass out fliers and introduce themselves to local businesses. The results of the ambassadors’ efforts can be seen throughout the neighborhood, Turner said. 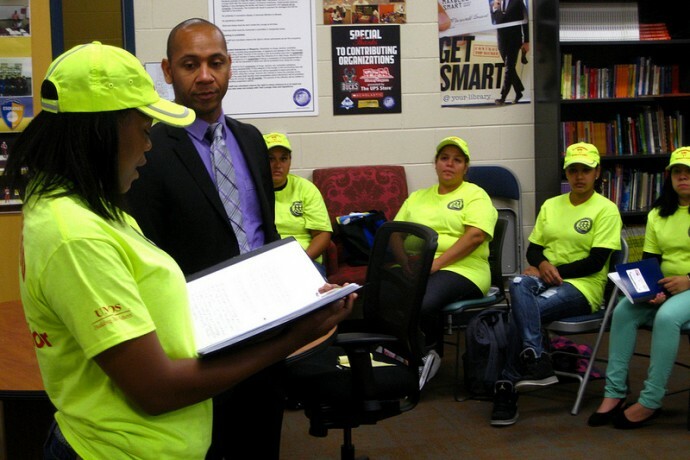 Participants work 20 hours a week and receive a stipend in addition to career and life skills training through Journey House’s Urban Careers Institute. 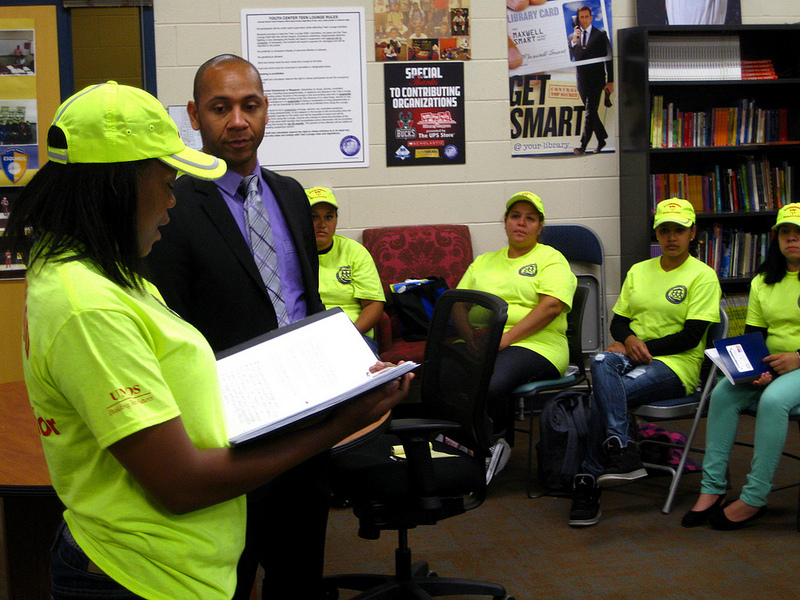 They also work with leadership and financial coaches to earn certifications in customer service and financial literacy. Each ambassador develops a portfolio consisting of a resume, mission statement and personal vision statement. The ambassadors come from all backgrounds, neighborhoods and walks of life, Turner said. Some are seeking education. Others hold degrees but could not find work. A former assembly line worker, Deal learned of the program while trying to find a job with assistance from Journey House. Now she hopes to go back to school and enter the medical field to support her 2-year-old daughter, Tatyana. Keonna Taylor, 20, is also a neighborhood ambassador. A lifelong Milwaukee resident, Taylor said she worried that she would never find a job and “didn’t know where to begin.” With help from Journey House, she now has a scholarship to begin studying to become a certified nursing assistant in October. Reciting her vision statement to her fellow ambassadors, Taylor said that she sees herself graduating from college and earning a stable income. Journey House, 2110 W. Scott St., provides community residents with educational, athletic and career programs ranging from citizenship classes to GED assistance. 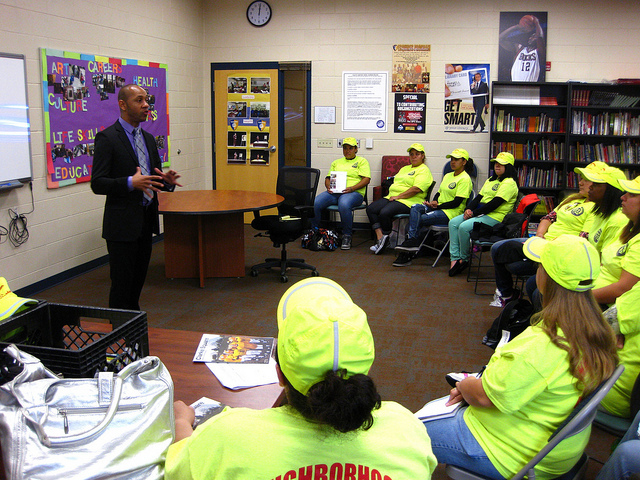 Turner said that funding is an ongoing concern for the neighborhood ambassador program, which is funded through June. Sharing his own vision statement, Turner said, “I envision a larger picture for the ambassadors, and I hope we can get the program funded to the capacity it should be.